I wrote in an earlier post how it was time to vote out every member of the House or Senate up for re-election next year. Ninety percent of Americans are dissatisfied with the job Congress is doing and the other ten percent are just wrong. Now it looks like that won't be enough to get the kind of politician who is killing this country out of Washington. Looks like we have to move on to other government agencies as well. Please tell me you heard about the Federal Emergency Management Agency's "press conference" this week to take questions on their ongoing effort to assist in the battling of the Southern California wildfires. Rather than accept questions from actual journalists, who were given just 15 minutes notice that the Q & A was happening, the deputy director of FEMA Harvey Johnson instead put his own employees in the briefing room to pose as reporters. Then he only called on his own people to ask softball questions that he could then answer to make sure FEMA was put in the best possible light. 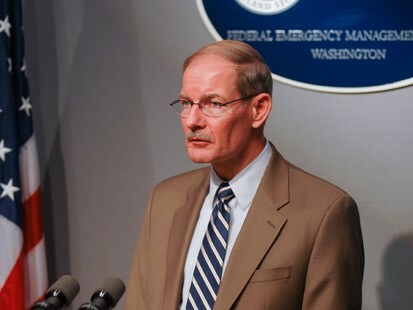 As an aside, FEMA starred in what I think was one of the most significant, yet underreported stories of 2007. They knew Hurricane Katrina refugees were getting sick, poisoned by breathing formaldehyde from living in the poorly ventilated government provided trailers and they did nothing about it. When enough children got sick enough and the Center For Disease Control started an investigation, them FEMA was forced to confront the problem. Please understand, United States government employees knew they had put their own citizens in poisoned trailers - they had been alerted to the problem by dozens of sick residents -and waited until someone else found about it and then were forced to act. Last week the Republican National Committee added this page to their official website. Today the RNC is very proud to introduce our newest web feature and game, "Scariest Democrat." What do Halloween and politics have in common? Scary Democrats! Every year, the Republican National Committee has a hard time determining who is the scariest Democrat of the bunch. Just like the fall harvest, there's an abundance from which to choose. That's where you come in. We need your help in determining who the RNC should announce as the "Scariest Democrat" in 2007. 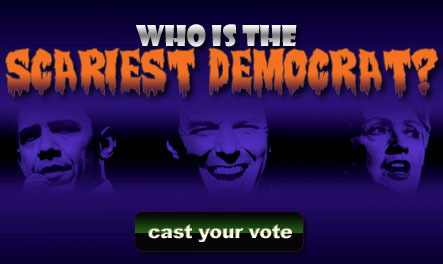 Cast your vote and play today to help the RNC peg the "Scariest Democrat" in American politics." Are you freaking kidding me? This is what passes for politics now? This is how a Presidential campaign is being run ? These are adults, not Highlights Magazine puzzle editors making these decisions? If John F. Kennedy were alive today he would demand to be immediately taken to Dallas and rent a convertible. Did they think that noone would know that those weren't real reporters? It just makes you want to be in the room when the powers that be come up with the idea to do this. I'm guessing you'd be the only one in the room thinking "You can't be serious....right?" "It disgusts and appalls me that a draft dodger is continuing with his war, at the expense of our brave men and women in the military. I know what its like – I was in the ARMY ROTC program at UCLA for a little over a year. I got out because I realized I would be able to do more good for my country as a private attorney or working for the government rather than just a pawn in a war. Speaking of, this country needs new leadership. The Bush administration is running things in a way that displays the attitude “who cares about who we lead, let’s profit from our greed”. We cannot allow that to go on any longer. In the very least, diplomatic negotiations need to be on the table as a possible solution – and the administration will hear none of it. They even have the decorated General Petraues give testimony to support their position to “stay the course”. Granted, he has served his time as a commander of troops; but I saw some of the presentation – not since former AG Alberto Gonzales have I seen such a lack of passion and awareness when talking about a topic as important as the military operations in Iraq." I really like your blog. I'd ask you to check out mine, but you may be too busy maintaining yours. If you have a myspace acct and request me (my profile is private so you couldn't simply read my blogs without logging in) then please do so. Otherwise, I'll simply look forward to reading your next posts! The Democrats have their problems, but they don't generally fall to the depths of the GOP when it comes to being mean spirited and petty. Sigh. I swear to god, if we get another Republican in office in 2008, I'm going to...I'm going to just...move to Canada. I've been saying that for 8 years, though. I know it's been a while since you posted this entry but I thought I'd direct you to an NPR Morning edition story about the toxicity of the trailers. FEMA went so far as to tell "workers to stay out of thousands of its stored travel trailers, amid concerns about exposure to hazardous fumes." Yet they force people to live in these trailers for years.